Dopamine is often referred to as the “feel-good” neurotransmitter. Older adults who aren’t getting enough of this important chemical in their brains run the risk of developing emotional health conditions such as chronic stress and depression. 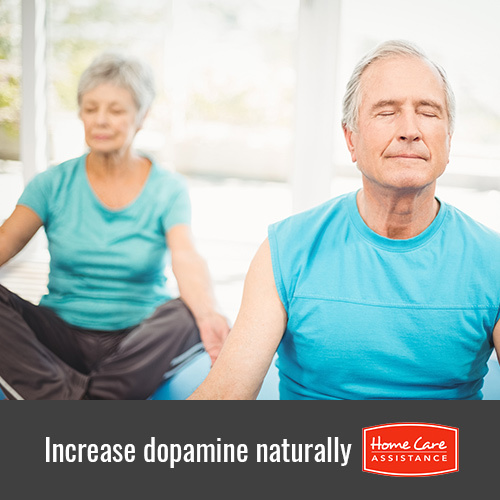 Luckily, there are a few ways your senior loved one can naturally boost his or her dopamine levels and feel happier. Harrisburg in-home care experts explain how. The stomach contains many different forms of bacteria that protect us from lingering toxins in the food we eat. Probiotic foods and supplements can help your loved one protect these healthy bacteria while flushing out dangerous toxins. Without the proper bacteria in your loved one’s stomach, his or her body cannot produce and regulate dopamine, serotonin, and oxytocin. Our bodies “reward” us with a rush of dopamine whenever we complete a difficult task. However, many people do not feel the same sense of accomplishment with goals that take more than a few days to complete. Whether your loved one would like to lose a few pounds or read one book a month, using a calendar to visually track the progress can increase his or her dopamine levels just as if the task were already completed. It is difficult to produce ample dopamine without a positive mindset. Many people who experience chronic stress, anxiety, and apathy also have very low dopamine levels. Regularly meditating not only increases dopamine levels, but it also addresses the root issues that could be interfering with your loved one’s brain chemistry. Magnesium deficiencies often go unnoticed because the side effects gradually become worse over the course of many years, which is one of the reasons why the National Library of Medicine has stated over 50 percent of adults are deficient in this chemical. Without enough magnesium in your loved one’s diet, his or her body will have a difficult time controlling dopamine and other chemicals in the brain. Make sure your loved one checks with a doctor before adding a new supplement to his or her diet. A healthy diet should contain all 22 key amino acids, including tyrosine. This particular amino acid is one of the building blocks of dopamine, and it is rarely found in processed foods and snacks. Almonds, eggs, beef, bananas, and avocados all contain a large amount of tyrosine and should be a regular part of your loved one’s diet. Seniors with low dopamine levels may be at risk of developing Alzheimer’s and other forms of dementia. If you are concerned about your loved one’s cognitive health, turn to Home Care Assistance. We are a leading provider of Alzheimer’s and dementia care Harrisburg seniors can count on, and all of our caregivers are trained in the Cognitive Therapeutics Method, an activities-based program that works to delay the onset of dementia and helps seniors build routines and gain a sense of pride and accomplishment. For more information, call (717) 540-4663 today.